We can make Tyvek sterilization pouches for medical packaging up to 70” long. Ideal for long catheter packaging, such as angiography catheters. Pouch styles can be chevron and corner peel. Printing capabilities are up to 8 colors, flexographic and rotogravure capabilities. We can also supply Tyvek rollstock, medical packaging, for form fill seal machines such as vertical and horizontal form fill seal machines for medical device packaging. We can also supply the clear film laminate. We can also supply clear film sterilization pouches and Tyvek rollstock, that can be used for gamma and electron beam sterilization. We also can make peelable foil pouches too for sterile vapor barrier protection. Tyvek sterilization pouches for packaging sterile medical devices are manufactured in standard and custom sizes from Dupont Medical Grade Tyvek® 1073B, 1059B and 2FS. We have the new transitional Tyvek for sterilization pouches. Tyvek sterilization pouches provide strength and bacterial barrier for packaging medical and surgical devices. We provide chevron and corner peel pouches in custom and standard sizes. Tyvek pouches for sterile medical devices have excellent pouch integrity and peelability with no fiber tear or particulate matter; and are made from puncture and abrasion resistant films and materials. We also offer other materials for medical packaging - a variety of peelable foil, clear film and paper laminate structures in many sizes. 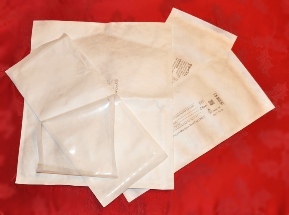 We offer unprinted or printed Tyvek pouches for packaging medical devices. In both standard sizes and custom sizes. To receive pricing information, you can inquire by email or phone. Please let us know: the dimensions of the pouch you would like, what grade of Tyvek, how many pouches you would like, and printing details if any.